Every season a new Sportfishing regulation is released by our government in association with the National Park authorities. Trout season normally goes from November 1st until May 1st on most of our rivers. There are a few exceptions to consider. Some areas remain open until May 31st, and others delay their opening until mid November..
We recommend our anglers to plan their trips avoiding the first week of November, since we usually find out the exact opening date around July. The new fishing license for next season will be printed by then. Weather-wise, from November to mid December we usually go through sunny and windy days mixed with some calm ones. Not every spring is the same, and the weather can rapidly change. The Andes mountain range keeps much of the rain on the Chilean side. Depending of how hard the winter treated us, the water level of most of the rivers can be still a little high, which might force us to focus in the smaller streams, river side channels and shallower water. This is a good time for nymphs, big dry-droppers and streamers sometimes fished using sinking heads (combined type lines, teeny style). Some dry fly action will bring some nice trout and there is no doubt that the acivity on the surface will increase on warmer days. You never know, surprises in early season are not uncommon. Some big trout that came into the river systems, decide to stay for a while and feed from some recently born trout. Especially big browns! Also keep in mind, that fly fishing in the lakes can be amazing. Trout are very hungry after spawning, and will take almost anything in a hurry. It is great fun! "Inquire about Early season special prices, usually before December 10th"
From December 15th until the middle of March the conditions gradually change and improve as the weather gets more stable. Warmer and even hot days start to show. 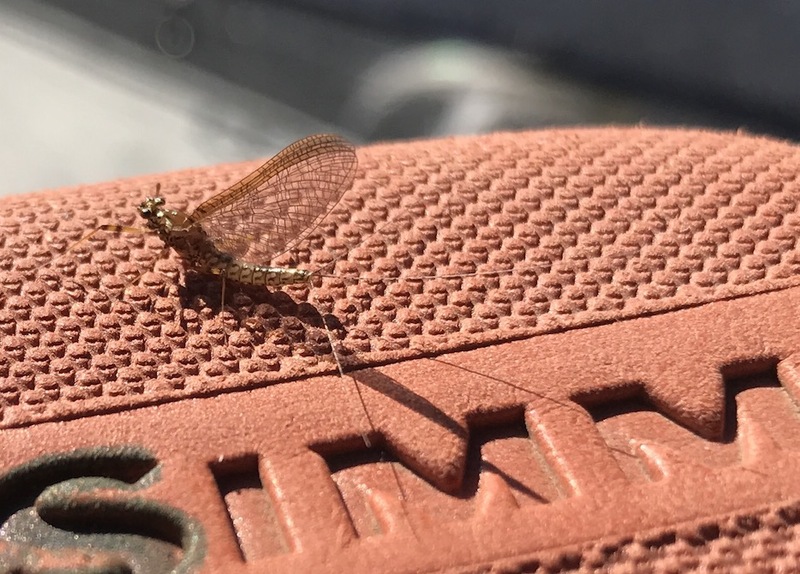 Milder winds and better water temperature suddenly turn the caddis and first mayfly hatches on. 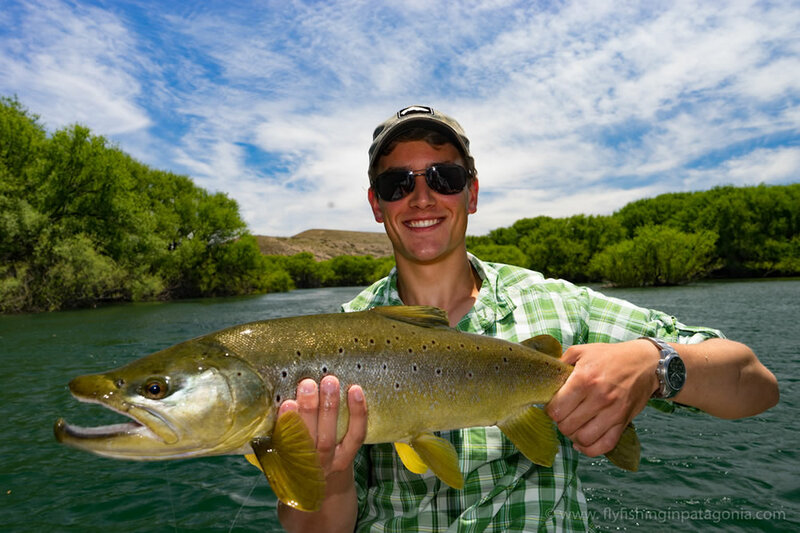 Trout rapidly start to feed on the surface almost everywhere, which provides non-stop fun on sunny days. Once summer is settled, hatches turn very predictable. Days are very long, but the best fishing hours can be easily chosen which will give us time for a pleasant lunch followed by an almost necessary break ("siesta & mate time" is not mandatory, but you'll learn to enjoy it, especially during those hot summer days!). Great evening hatches! So in this period, expect a lot of action on the surface and subsurface. We will fish a lot of dries, cripples, emerger and nymphs. Won't ever forget to carry some streamers with us. This is a good graphic way to see some good dry fly action in Early February - Watch this video Dry flies and Greg LeMond on the Malleo river. Fishing in the lake will be always fun. 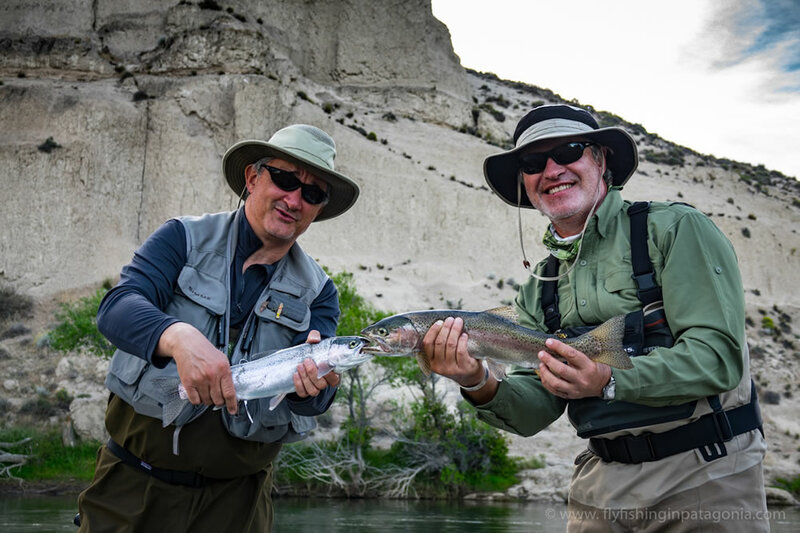 Cruising large rainbows over 20" are easily spotted feeding along the banks and won't hesitate to take a traditional dry fly. Streamer fishing will always work! Gear: Some like to wet wade using a neoprene sock and light wadding boots, others prefer to use breathable waders. Bring light fleece insulation for the mornings and fast drying light shirts for the rest of the day. Never go out without a light rain jacket or wind breaker. Sunblock, hat, polarized glasses are a must! Don't wait until the last minute to plan your trip. Please have in mind that this time of the year will be a busy one. January and February is school vacation time in Argentina and everyone escapes from the big cities! Late March is a great time to fly fish, especially when the first frost turns the baetis and callibaetis cycles on! Light tackle, long leaders with thin tippets become more important. 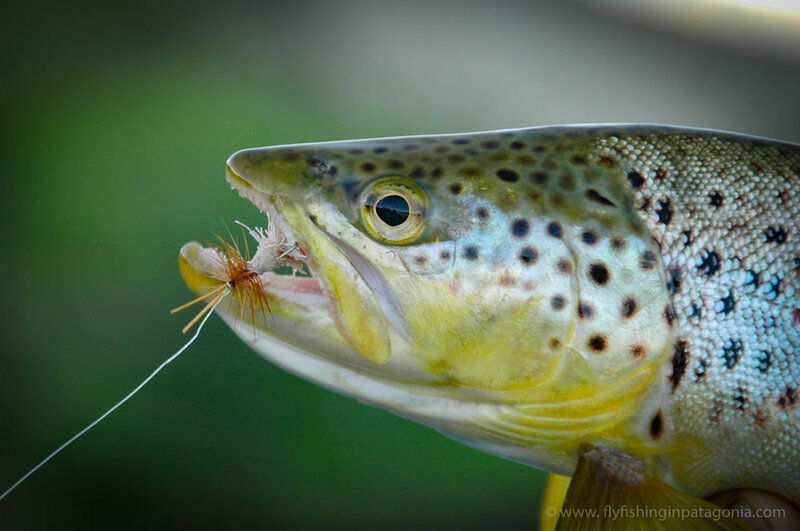 Fish feed in slower water sipping from spinners, cripples and get wild and aggressive during the moments the emergers start to hatch becoming duns. In many of the cases this happens at the middle of the morning when the water temperature rises a little bit and sometimes it lasts a full day with peaks periods where more "bugs" will appear in waves. This is not the only kind of fishing during this period. It is also a good time to start thinking about casting streamers in certain locations expecting to find aggressive browns and rainbows feeding on minnow schools and some are already thinking about spawning. Days become shorter and cooler. In most of the cases the action is concentred at the middle of the day, so depending the guests appetite, we try to fish as much as possible, probably non stop from 10:30 / 11 am until the activity slows down (probably 3 /4 pm) and then have lunch. We usually go home early (7pm). From mid April on, we offer promotional rates. Please ask! Fishing in May on some rivers - big browns!!!! Check each season regulations for detailed information, but for the last 12 years it lasted until May 31st (for just some of the rivers). 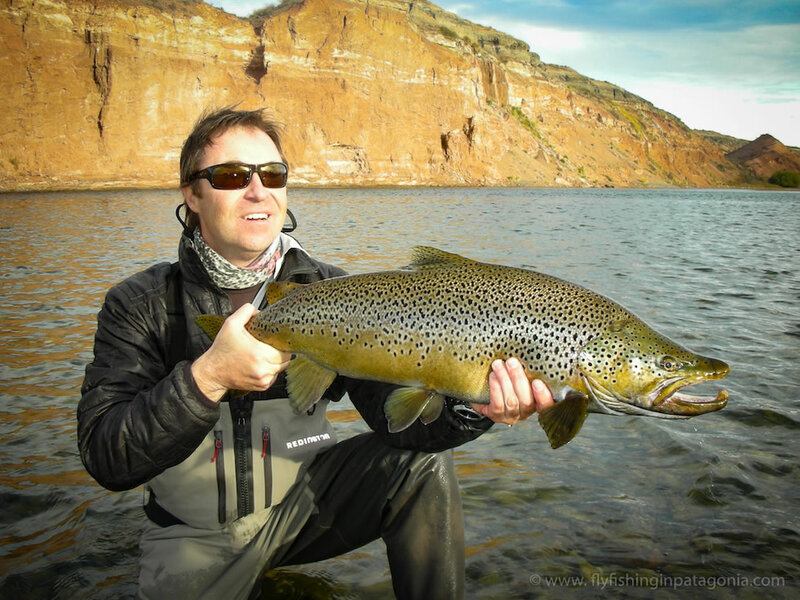 The main course will consist of trying to irritate this big and wild german brown trout that are getting together into schools and beginning to think of the spawning process. Colder and shorter days will concentrate all the action during the warmer hours. The best hours to be out fly fishing will range between 11AM and 4PM. 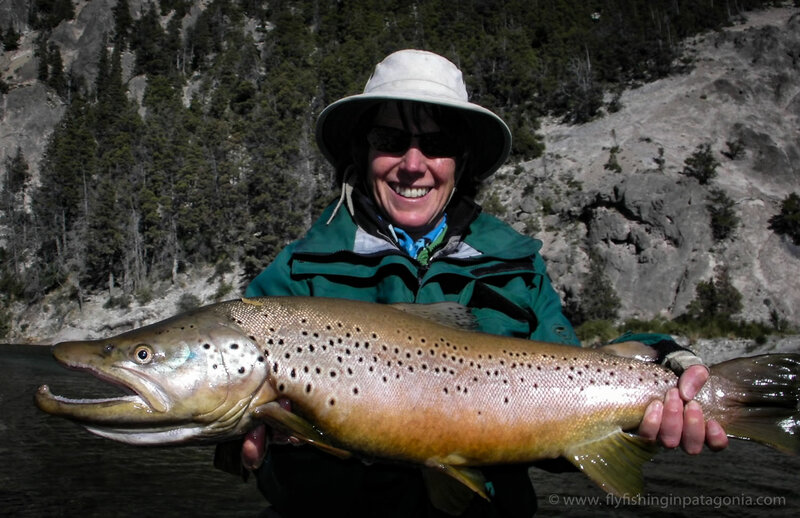 Float trips will make our job easier and provide extra chances to find moving trout, that will be traveling in schools and looking for mating partners. 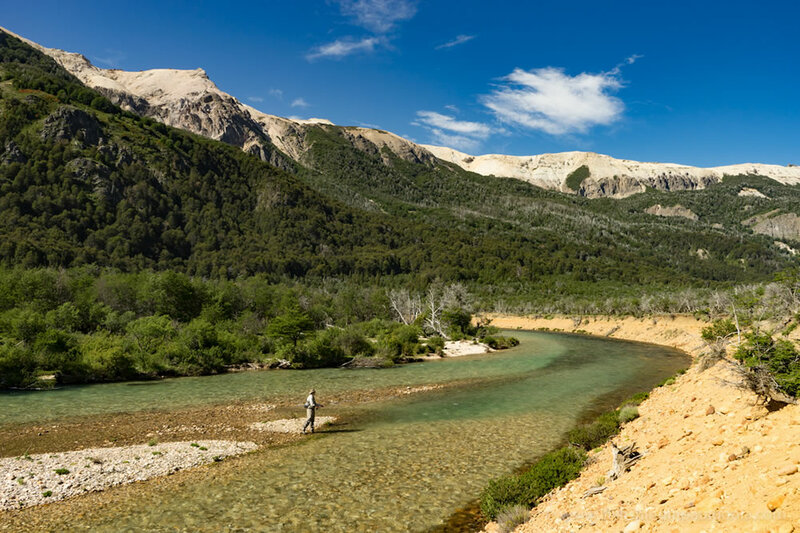 Not every river will be affected by this special fishing extension. 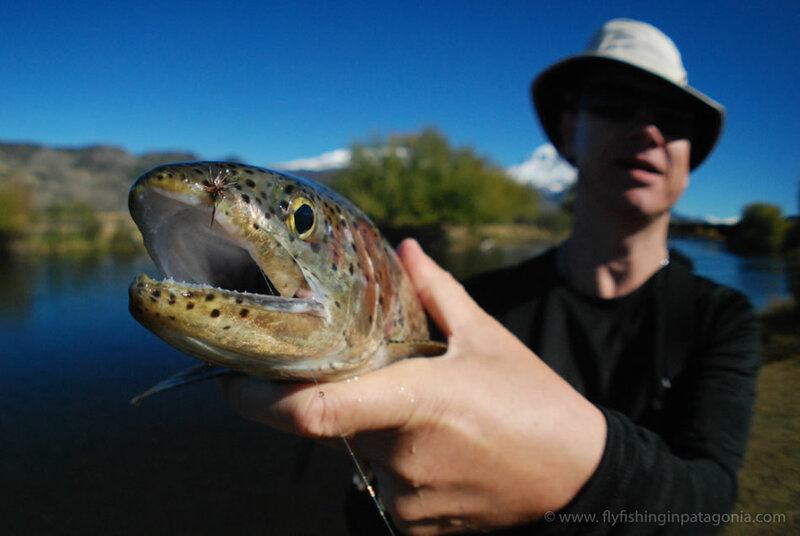 Rivers like middle Limay, Chimehuin, Collon Cura, Part of the Alumine, a section of the Malleo, Caleufu, Quiquihue are usually included and are great fun to fish. Suggested Gear: Some people take out their old neoprene waders from the closet and feel comfortable using them. I still prefer to use a thicker thermal insulation layer under my GORE-TEX ones. Good underwear + shirt + fleece will be enough for most of the days. Carrying the rain jacket is a smart thing to do, even on sunny days... You never know. Rain season is close. For the brave who like to try the fishing extension, we have great prices!